Cortisol is a hormone, that is very important to human function. 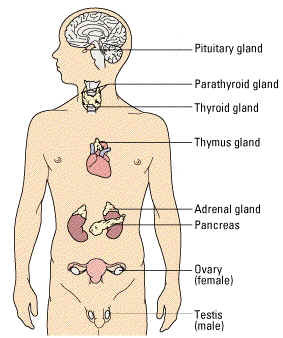 The adrenal glands secrete cortisol and part of the endocrine system. Anatomically the adrenals sit on top our kidneys. A main effect of cortisol is to reduce the reserves of protein in all body cells except cells of the liver and gastrointestinal tract. It also makes fatty acids available for metabolic use. Cortisol is referred to as the 'stress hormone' because it is released with prolonged or intense stress. Our immune system cells, has a special enzyme built into the cell, it is called 'telomerase'. 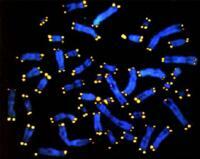 Telomerase acts on the telomere keeping the 'cell clock' long. This keeps the immune system cells young by preserving their time clock and ability to divide. How does cortisol tie into this study? Cortisol prevents our immune system cells to activiate telemerase, so the immune system begins aging, weakening, and dying like other cells. People who do not manage their stress through relaxation, meditation, prayer, breathing and other techniques have shorter telomeres on their immune system cells. In this photograph, you can see the chromosones of an immune system cell, the chromosone is colored blue. The yellow cap on the ends is the the telomere. This Mind Body Study shows the link between the power of your mind, to manage and reduce your stress, learning to relax and let go, as compared to those who do not. It explains why people who are under stress gets sick more often, with a variety of health care problems. Every student with us at Tibetan Kung Fu and Tai Chi Chuan is taught and encouraged to practice calming the Heart - Mind (Yi). We know through personal experiences that the benefit of calming the mind, soothing the heart, and smoothing our chi is beneficial for ourselves and those we are around. If you want to read further how Cortisol is reduced through meditation.